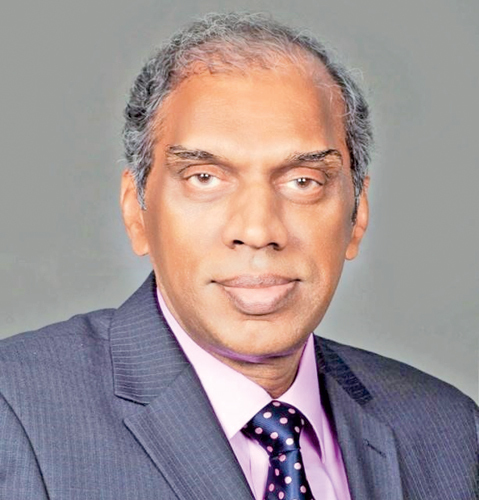 Dr. Hector Weerasinghe, Former Director of the National Hospital of Sri Lanka. In 1990 I became the first Medical Superintendent of this facility and take a great pleasure when going down the memory lane. Later, I was elevated to the position of Deputy Director in charge and continued until I was appointed as the Director NHSL in the year 2000 where I continued to serve until my retirement in 2011. The new Accident Service is celebrating its 25th Anniversary this year. One might wonder why it is called “new” when it is 25 years old. But a person close to it would not wonder. The first ever Accident Service was established in the landmark Victoria Memorial Building on Ward Place in 1956 with very limited facilities. The present one, we used to call as the ‘new’ Accident Service. I was the leader of a dedicated team in the Accident Service for 10 years and provided guidance and supervision as Director NHSL for another 11 years. In fact my association with the Accident Service runs into more than half my career and this was the most critical and challenging period. The occasion of celebrating the silver jubilee of the Accident Service provides me a rare opportunity wrapped with honour to reminisce that period of 21 memorable years. I was the District Medical Officer, Panadura in 1989 when the Ministry of Teaching Hospitals was looking for an eligible candidate to occupy the newly created post of Medical Superintendent of the newly created Accident Service of the General Hospital Colombo (GHC). I tried my luck and it worked. I came to General Hospital, Colombo to take charge of Accident Service as its first Medical Superintendent. Dr. Oliver Fernando –a senior Medical Administrator was the Director-GHC. I reported to him. A Fellowship in the Management of Accident and Emergency Services in the UK for one year sponsored by the British Council was attached to this position. It is my understanding that Dr. Lucian Jayasuriya- the Director General of Teaching Hospitals along with Daya Samarasinghe – Secretary of the Ministry were instrumental in planning and organizing this fellowship with the approval of Sunethra Ranasinghe - Minister of Teaching Hospitals. I flew into the winter in September 1989 and returned after successful completion of my one year training in UK. During my training I had the opportunity to work in the Birmingham Accident Hospital, a hospital dedicated to Trauma. The training programme was comprehensive and well organised to cater to the needs of a developing country. I was also exposed to Accident & Emergency Departments in a few hospitals in West Midlands. I returned to assume duties as the first Medical Superintendent of the New Accident Service after the training in September 1990. The newly constructed building was ready and state-of-the art medical equipment was on its way to the Accident Service for installation. A team of consultants and a few technical personnel were still busy in making the final touches to the new building. The taking over and handing over of many different items worth of hundreds of millions of Rupees was taking place at the time. The entire team including matrons, nursing sisters, nurses in charge, pharmacists, radiographers and many others later told me that this was the most hectic period in their career. The new building was complete with all the latest equipment and a generous gift to Sri Lankan people from the Government and people of Finland. This land mark complex has witnessed and will continue to witness the gratitude of a nation of this tiny island in the Indian Ocean to a generous nation in far north of Europe. This facility occupied the top most place of the Finnish Aid Programme. Finland donated a Building designed ideally suited to a tropical country. Air conditioning is restricted to the essential areas and the remaining area is provided with fresh air through natural ventilation making the best use of sunlight bringing the hospital electricity bill to a minimum. The new Accident Service with all the latest equipment was not a mere replacement of an old facility; it brought a revolutionary change to the old accident service established 60 years back. The thoughtful innovative improvements introduced in space and other facilities gave a feeling that the new accident service was very spacious and equipped with modern facilities equally beneficial to staff as well as patients. We felt this more strongly especially during the years of Sri Lanka’s civil conflict demanding emergency medical care for the victims of terror attacks. I wish to express my deepest gratitude to Anika and Juhani Annanpalo and Dr. Lucian Jayasuriya who were working in the Finnish Project for their readily available advice, support and encouragement being a great source of strength to me. The new building has the Accident Service OPD, Intensive Care Units, Radiology Department, operating theatres and a blood bank on the ground floor. It has a male and female observation ward, four orthopaedic wards, CSSD and a theatre complex dedicated for orthopaedic surgery. In fact the new facility was not a mere replacement of the existing facility. It was a combination of accident service and orthopaedic wards with operating theatres. In recognition of this fact the new complex was designated as Accident and Orthopaedic Service (AOS). As a result of the untiring work of the team we were ready to commission the new AOS Building and to receive patients by March 1991. 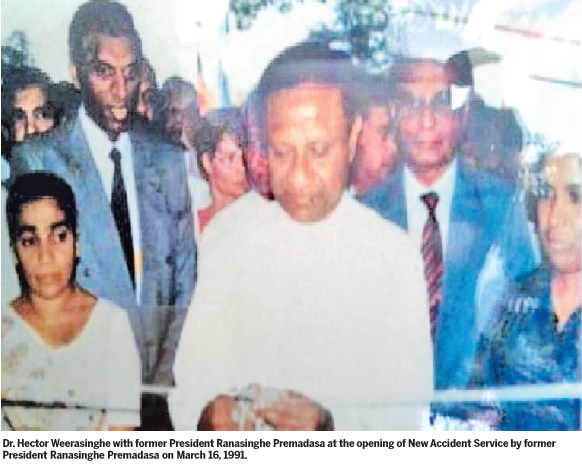 New Accident Service was opened by the then President Ranasinghe Premadasa on March 16, 1991. The Ambassador for Finland, Health Minister Renuka Herath and Health Ministry Secretary Dr. Joe Fernando graced the occasion with a large number of doctors, nurses and other employees of the hospital, Project officials and distinguished invitees participating at the event. The opening of this new facility marked the dawn of a new era in Trauma care services in Sri Lanka. For the first time a Triage Unit manned by trained nurses was established to receive and assess the patients as they are brought in. Although the novel change was a consolation to patients and their caregivers, it was not without resistance. The opposition came from within and mainly from Trade Unions. This system now operates in other hospitals as well which is also a very effective public relations exercise. On the advice of the Finnish Team that worked with us, during the first year a separate unit was established to look into the Training needs of various categories of employees and to coordinate all the training activities in a better organised manner. For the first time the Janitorial service and security service was out-sourced to the private sector with the commissioning of the Accident Service. It was extended to all the other units of the hospital later as it was found to be very productive and cost effective. In the past, the common hospital laundry did not have the capacity to cater to the entire hospital by providing washed and dried linen on time. This compelled us to seek the services of a few laundrymen (dhobies) who used to collect all the soiled linen, wash them manually and dry them in open areas of the hospital. There were instances where we had to postpone the routine operations due to non-availability of washed and dried linen during the rainy weather. The need to have a well equipped laundry with sufficient number of industrial type washing machines, driers and pressing machines for the smooth running of the hospital was identified by the Project and was fulfilled. The present laundry is fully geared to cater to the entire hospital. More than 4000 Kgs of soiled linen is washed and dried on a daily basis in the laundry. Continuous uninterrupted water supply is very vital for smooth functioning of a hospital. This need was fulfilled by constructing a massive water tower with a capacity of 100,000 gallons and with a dedicated supply line from Maligakanda reservoir by the Finnish project. Any person who walks down the Regent Street would not miss this water tower which stands tall as a landmark at the Cardiology unit end of Regent Street. Since the installation of this water tower we never experienced an interruption of water supply to the hospital. Transporting the large cylinders filled with oxygen to the hospital and taking the empty cylinders back for refilling to the private company was done by hospital employees. They performed this task daily and on some days a few times a day. This ensured the continuous availability of medical oxygen to all the operating theatres and intensive care units of the hospital. This was very cumbersome and made me nervous when there is a delay in bringing the refilled cylinders back.